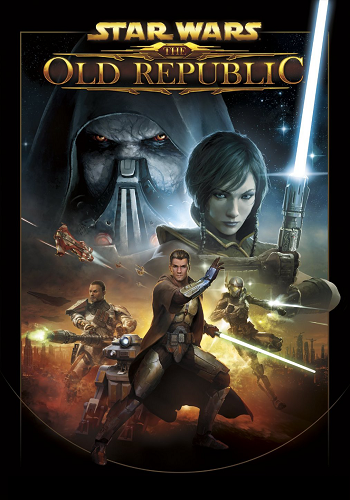 Star Wars: The Old Republic is a Star Wars MMORPG developed by BioWare set three centuries after their Knights of the Old Republic RPGs and approximately 3600 years before the feature films. Centuries after the events of Knights of the Old Republic II, the Sith Empire have returned to the galaxy to attack the Republic and its Jedi protectors to avenge the Sith's defeat in the Great Hyperspace War over 1,300 years previously. A tenuous truce was established after decades of war but the peace is fragile, and it is only a matter of time before the two factions break out into warfare. When George Lucas sold Star Wars to Disney, SWTOR was no longer canon and became part of the Legends expanded universe (and in fact gained the interesting distinction of being the final Legends work still receiving new updates and content as of 2018). The game's most unique aspect is its presentation; unlike many MMOs, the game is very focused on story, featuring fully voice-acted cutscenes for almost every quest, as well as lots of player decisions, similar to the Mass Effect series. It was released on December 20, 2011 (December 22 for some of Europe). On November 15, 2012, a free-to-play model was released, while still offering incentives to purchase a subscription. Ever since Disney's acquisition of LucasArts and Star Wars, the game has existed in a weird canon limbo, remaining pretty much the only sanctioned source of story content (in form of DLC expansions) for the Star Wars Legends, as opposed to the post-Disney continuity. A series of three books serve as a prelude. Fatal Alliance (dealing with tensions in the truce), Deceived (Malgus's story), and Revan (detailing just what happened to Revan and the Exile after the events of Knights of the Old Republic). Another novel, Annihilation, takes place circa the time of the game and focuses upon Satele Shan's son. The game has received four full expansions, which extend the story beyond the initial class quests. Rise of the Hutt Cartel deals with the eponymous Hutt Cartel's incursion on the planet Makeb and raises the level cap to 55. Shadow of Revan, deals with Darth Revan's return, and introduces the planets Rishi and Yavin 4, raising the level cap to 60. Knights of the Fallen Empire, features a new plot set after the war, focuses on solo content, revamps the companion system by allowing companions to take any role necessary, raises the level cap from 60 to 65, and is available free to all subscribers. Set five years after the current timeline, the players are released from carbonite freezing to find both the Republic and Empire conquered by the Eternal Empire, which, as the Outlander, they must stop. The storyline was given an initial release of nine chapters. Additional chapters were released about once a month starting in February 2016, completing in August 2016. A fourth expansion, Knights of the Eternal Throne, was released in December, 2016. It continued the Fallen Empire storyline and raised the level cap to 70. The official website can be found here .